21 things teachers can do to grow their PLN. ​For me, Twitter is a powerful educational tool, not only because it allows me to connect with other educational professionals and expand my ever-growing PLN (Personal Learning Network), but because it also provides me an opportunity to reflect and question my own teaching practice. So, what is Twitter and how can it be used to become more #connectED? ​Twitter is a free online social networking and microblogging service. Twitter allows its users to communicate by sending short messages (up to 140 characters), also known as ‘tweets’. Twitter also allows you to post images, videos and links to other websites making it a perfect tool for sharing ideas and resources for the classroom. At first, I was a little sceptical about Twitter - assuming it was only suitable for celebrity gossip and discussing what you had for breakfast. However, having used Twitter for several years, I now see the huge potential of Twitter to support teaching and learning! By far the biggest impact Twitter has had on my teaching practice is the hours saved in planning. Every day I come across new resources to use in my teaching and, like many other teachers on Twitter, some of these resources I've used the very next day! As well as helping me find lots of great resources to use in my classroom, Twitter has also introduced me to new ideas and methodologies, for example, flipped / blended learning, growth mindset and Project Based Learning (PBL) - to name but a few. In fact, many teachers are starting to use Twitter to take control of their Continued Professional Development (CPD). However, for me, the biggest draw for using Twitter has to be the ability to connect with amazing educators from all around the world and to share best practice! 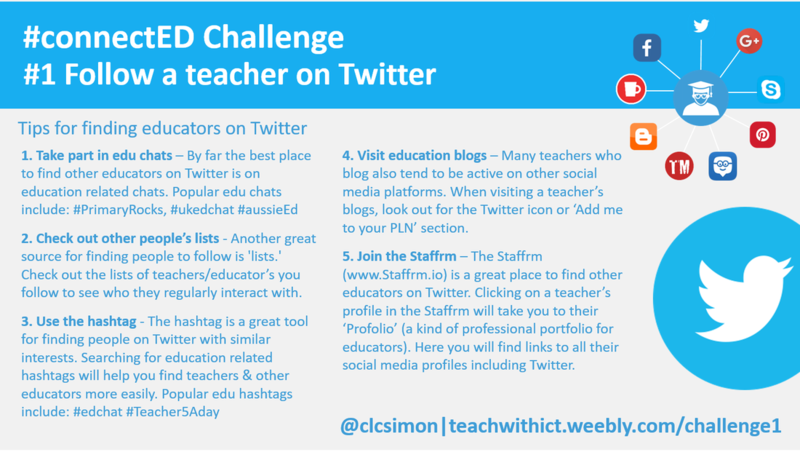 Take part in edu chats – By far the best place to find other educators on Twitter is on education related chats. Popular edu chats include: #PrimaryRocks, #ukedchat #aussieEd. Start by finding weekly chats that are appropriate to your phase/subject and then follow people who interest/inspire you. Top tip: Twitter chats, especially fast paced chats, can be a little daunting at first. My advice is, once you've found a chat, lurk for a while, follow contributors and, when you feel confident enough, contribute yourself. Check out other people’s lists - Another great source for finding people to follow is 'lists.' Check out the lists of teachers/educator’s you follow to see who they regularly interact with. Visit education blogs – Many teachers who blog also tend to be active on other social media platforms such as Twitter, Facebook, Pinterest etc. When visiting a teacher’s blogs, look out for the Twitter icon or ‘Add me to your PLN’ section. Join the Staffrm – The Staffrm (www.Staffrm.io) is a great place to find other educators on Twitter. Clicking on a teacher’s profile in the Staffrm will take you to their ‘Profolio’ (a kind of professional portfolio for educators). Here you will find, if they have one, a link to their education Twitter account. Invite people to follow you - One way to grow more followers on Twitter is to simply let people know you are on Twitter and invite them to follow you. If you have your own website you can place a Twitter sharing button on your home page or if you have your own teaching blog you can include a link to your Twitter profile in a blog post. Another effective method is to include your Twitter details in your email signature (Remember to use a different signature when emailing your students!) or other social networking sites such as Facebook or LinkedIn. Engage in discussions - Asking questions is a great way to get exposure on Twitter however, replying to questions can be an even greater way to grow Twitter followers. Replying to other peoples questions can help develop connections with new users and encourage them to follow you on Twitter. #SharingIsCaring - Believe it or not, not everyone is going to be interested in what you had for breakfast or when you last visited the toilet. The key to Twitter is sharing interests. People are more likely to share your tweets if they share a common interest or if they think what you are tweeting is of interest to others. Be yourself - Try to get the right balance between talking about yourself and talking about topics that are relevant and interesting (It's good to show a human side every now and again). Keep tweeting - This may seem obvious but the more you tweet, the more likely you are to have others follow you however, beware. If you tweet too much, you might end up losing followers. You may need to experiment to get the right balance. Just join in - take part in chats, look at who others follow, ask questions, don't worry about sharing views etc. http://www.teachertoolkit.me/2016/04/03/101educators/ - 101 Educators to follow on Twitter by Ross Morrison McGill (aka @TeacherToolkit). How to stay safe when using twitter - Tips for staying safe on-line when using Twitter. http://cybraryman.com/twitterforbeginners.html​ - A beginner's guide for teachers on using Twitter.